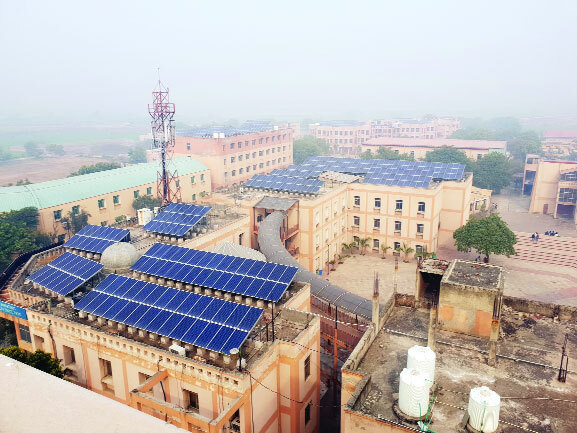 The PDM University, Bahadurgarh, Harayana has become one of the front runners in the State to utilise solar energy extensively for illuminating the campus spread over 95 acres of land in Delhi-NCR. The university has installed 3400 solar panels on the roof top of all the buildings of its various departments like Engineering, Dental, Pharmacy, Science, Humanities, Architecture, Arts, Law, Business & Commerce, Mass Communications & Agriculture along with institutions like Polytechnic, Public & Primary School associated with 25-year-old PDM Group. These panels will generate energy to run a 1,100 KW solar PV plant project. All the energy needs of hi-tech class rooms, laboratories, hostels, mess, sports gymnasium, offices and administrative building of the university will be taken care by this solar plant. The solar panel systems will be linked to a centralised electrical substation situated inside the campus for collective solar coverage. Chitresh Lather, CEO of PDM University, said that several benefits like eco-friendly approach, cost-effectiveness, diverse application use and constant technological advancements have encouraged the university management to adopt solar panel concept model. “Learning about renewable energy early and being exposed to solar panels on top of schools and colleges will have an incredibly positive effect on students who are future consumers,” he said.